Many people are extremely against breeding hybrid Macaws. While hybrids like the Camelot Macaw are extremely colorful and may fetch higher prices than fullblood Macaws, they also may look very much like fullblood Macaws and may be accidentally bred under false impressions. The offspring will not be pure and will have different temperaments than those that would have resulted from a pure fullblood cross. Also, because it is illegal to own wild-caught Macaws, captive Macaw bloodlines must be kept pure or no more pure Macaws will exist in captivity. Last, the problem with hybrid Macaws such as the Camelot is that purebred Macaws are becoming extinct in the wild. In the future, captive bloodlines and breeding programs may become important in preserving species. If the bloodlines are diluted by accidental or intentional crossing with hybrids, certain species of Macaws could disappear forever. Camelot Macaws should only be purchased at the age of eight to ten years if you would like to ensure that you would be able to predict their temperaments. Camelot Macaws should always have fresh water. They should be fed a variety of fruits and vegetables, greens, grains, nuts, seeds, and a mineral supplement along with peanut butter or other fatty, high-protein treats. They are susceptible to Macaw Wasting Disease, especially in the San Diego, California, USA region. This disease is characterized by vomiting, whole seeds being passed, weight loss, and pain. Also common is the Poloyoma Virus for which they may be vaccinated. Breeding Camelot Macaws reach sexual maturity at four to five years of age but should not be bred until they are about seven to 10 years old. Many people are against hybrid Macaws and would suggest that Camelot Macaws should not be bred at all. Though Camelot Macaws are wildly adored by their fans, others tend to be quite hostile toward these and other hybrid Macaws! Camelot Macaws tend to have rather unpredictable or inconsistent temperaments. While purebred Macaws are bred for certain traits, hybrids usually are not bred for personality but color, which means their characters may be uncertain. Also, Camelot Macaws live for about 80 years, but will not develop their unique personality until they are about nine years old. This means that if you buy a sweet baby Macaw, it may grow up into a hostile adult. Camelot Macaws need special attention to their socializing to ensure that they will make friendly, docile pets but when properly raised are often highly intelligent, inquisitive, and great conversationalists! Like all Macaws the Camelot Macaw needs a large outdoor aviary of 24 by nine by six feet with an enclosed shelter, constructed of strong wire or chain link. These birds are avid chewers and need plenty of wood, as bored Camelot Macaws will be destructive, chewing on their cage or anything else they can find! Like all Macaws, they tend to be quite noisy! Inquisitive by nature, Camelot Macaws relate to the world by chewing on things, "feeling" them with their mouths! This means gentle biting characterizes their behavior, but sharp bites may be inflicted when the Macaw is extremely upset or frightened. Camelot Macaws should always have fresh water. They should be fed a wide variety of fruits and vegetables, greens, grains, nuts, seeds, and a mineral supplement along with peanut butter or other fatty, high-protein treats. The Camelot Macaw is a large and colorful bird! It is a cross between a Scarlet Macaw and a Catalina Macaw. 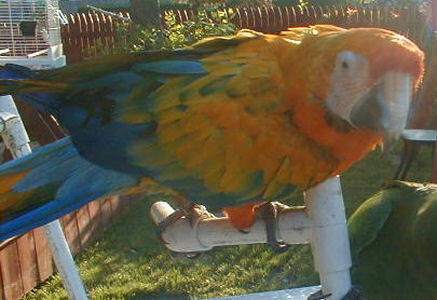 A Catalina Macaw is a cross between a Scarlet Macaw and a Blue and Gold Macaw. Camelot Macaws may be crossed with Scarlet Macaws to produce Capri Macaws.